Twelve years ago, you may have had a great love that you thought would last and chose matching tattoos to commemorate your affection. You may have been passionate about a movie or cartoon character and had their visage etched directly into your skin. However, times change and people grow older and more mature, and the things that were once significant become not so important anymore. If this sounds like you, tattoo removal may be something that you’re looking into. Of course, some tattoo removal methods are more effective than others. Finding the method that’s right for you requires meeting with experienced professionals who are also a good fit for you. With that in mind, here are a few of the different tattoo removal methods and the pros and cons of each. When you think of dermabrasion, you may think of sand paper, and you wouldn’t be far off. Dermabrasion is a deep skin exfoliation that sands down the skin with a brush to remove the top and dermis layers of the skin. Although less expensive than some other removal methods, the procedure is quite painful and you may end up with more skin loss than just where your tattoo was. Many tattoo artists use saline removal to get rid of tattoos. The method seems safe: the removal artist injects saline into the skin around the tattoo ink to fade the tattoo. Although most effective on older tattoos, it may simply fade the tattoo and make it easier to cover it up with makeup on your own rather than really removing the ink altogether. Another method that some people opt for is surgery. Essentially this involves cutting the tattoo out of your skin. This sounds like it would be successful, but even highly trained surgeons are sometimes not able to completely remove all the ink, and you may be left with scars worse than the tattoo itself. Laser tattoo removal may cost more upfront and require several treatments depending on the size and colors of your tattoo. However, it is the most effective method used by tattoo removal companies. Furthermore, it’s the only FDA-approved method of removing body art and will have the least significant side effects later in life. Whatever your reason for wanting to erase your ink, by paying a little more for laser tattoo removal, your tattoo will be out of sight and out of mind forever. 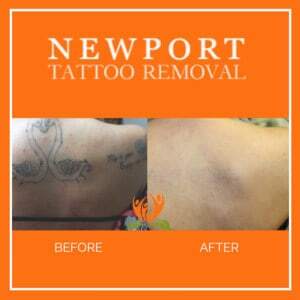 By talking to the professionals at Newport Tattoo Removal, you’ll be better able to find the right removal method for you. Give us a call at (949) 631-9009 to schedule a free tattoo removal consultation and learn what it will take to get rid of your unwanted ink. You can also use our online contact form.